Aid distribution point in Bangui, Central African Republic (CAR). The United Nations relief wing today voiced deep concern at the resurgence of attacks against humanitarian workers in crisis-gripped Central African Republic (CAR). According to the UN Office for the Coordination of Humanitarian Affairs (OCHA) in the African country, there were 336 attacks against humanitarian workers in 2016, 56.8 per cent of them robberies and burglaries. Five humanitarian workers were killed in 2016 in the line of duty, and according to OCHA Bureau Chief Joseph Inganji, a total of 24 have been killed since 2013. These attacks occur as humanitarian crises multiply in several prefectures with an alarming increase in the number of displaced. “Humanitarian action has no other purpose than to save lives […] tackling the humanitarian community is tantamount to attacking the most vulnerable populations, those who need often vital assistance,” he said. During the last quarter, the outbreaks of violence displaced more than 70,000 people. In some areas humanitarian workers cannot reach the displaced who are hidden in the bush due to insecurity. The most negative impact of the reduction of humanitarian space is thus felt by the most deprived. Mr. Inganji, however, said that the humanitarian appeal of $532 million has been “poorly” funded, with only 34 per cent of the target met. In 2017, about 2.2 million, or nearly half of the 4.6 million people in the country will be in need of humanitarian aid. Mr. Inganji hopes that OCHA will be able to reach all of them, but the situation for security and financing must improve. 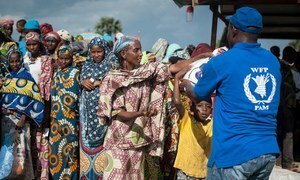 Due to a lack of funding, the United Nations World Food Programme (WFP) is running a risk of soon needing to halt its aid to 150,000 people in crisis-torn Central African Republic (CAR) who have been displaced by violence.